Learn how to identify and safely control corn earworm caterpillars without using toxic sprays or chemical powders! 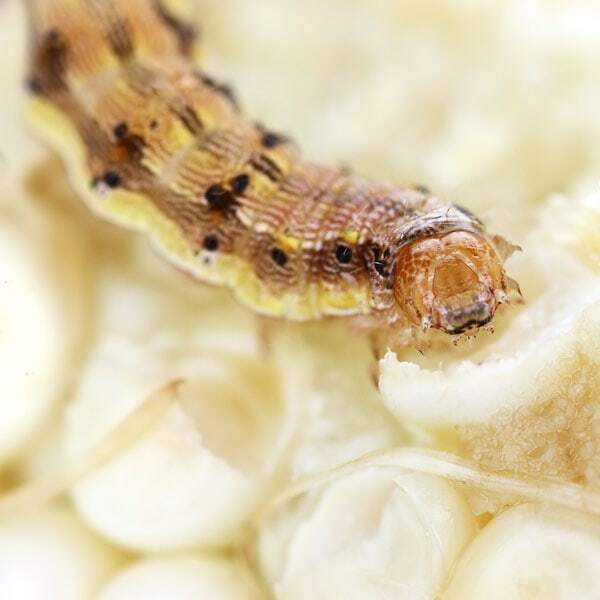 Common in vegetable gardens throughout North America, the corn earworm (Helicoverpa zea) is one of the most destructive insect pests attacking corn. It’s also known to bore into other fruiting vegetables and feed on lettuce. 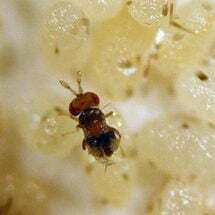 One worm can do extensive damage, and often a single larvae is all that’s found on a fouled ear. The corn earworm is also a serious pest of cotton where it is known as the cotton bollworm. On tomatoes it is known as the tomato fruitworm. Full grown larvae (1-1/2 inch long) are lightly striped and vary in color from a light green or pink to brown. They darken as they grow older. Adults are night-flying, dull greenish gray or brown moths (1-1/2 inch wingspan) with irregular darker lines and spots near the outer margins of the fore and hind wings. During the day they hide in nearby vegetation, but may occasionally be seen feeding on nectar. Note: Adult moths are good flyers, and able to move long distances. Each year they migrate from warm southern areas back to northern states where they are subject to winterkill. 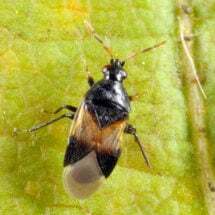 In areas where this insect survives the winter, pupae hibernate in the soil. Adult moths emerge anywhere from February through June, depending upon temperatures, and deposit their eggs singly on corn silks and other plant parts. Each female can lay up to 3,000 eggs, which hatch in two to ten days. When larvae emerge, they burrow directly down through the silks into the ear tip, becoming fully grown in 3-4 weeks. Corn earworm are extremely cannibalistic, which tends to limit the number of larvae to one per ear. When full grown, they drop to the ground to enter the soil for pupation. Usually two generations develop in the north, with as many as six in the extreme south. Damage usually begins in the corn’s silk, where the moth deposits its eggs. The caterpillars follow the silk down to the ear, eating as they go. Extensive damage is often found at the ear’s tips, where the worms devour kernels and foul them with excrement. The larvae often destroy the silks before pollination is complete. The resulting ears are deformed and susceptible to mold and disease. Worm damage is often confined to the tip of corn ears and can easily be cut away. Worms frequently follow leaves down the ear, leaving excrement and settling into kernels well in from the tip. It doesn’t take much of this kind of damage to make the entire ear undesirable. Each year, copious amounts of pesticides are sprayed on commercial corn fields in attempts to kill larvae. Runoff from these sprayings contribute to watershed and water table contamination while the spray itself decimates beneficial insects. Genetically engineered corn, each kernel producing its own pesticide, was developed with corn earworms in mind. An Integrated Pest Management plan that deals with the earworm at all three stages is the best way for corn growers to combat them. As moths, corn earworms are great travelers. Continued vigilance is needed. Just because you had them well-managed the previous season doesn’t mean they won’t glide back in on the first warm breeze come springtime. Don’t mulch ahead of winter without first getting as many pupae as you might have out of the soil. Till your soil fall and spring to expose the pupae to wind, weather, birds and other predators. Got chickens? Turn them loose after harvest to pick the grubs from your soil. Watching them work can be very entertaining! If you suspect your former corn patch might harbor corn earworm pupae, try broadcasting beneficial nematodes into moist soil well ahead of first frost. Word of mouth suggests this is a helpful component of any earworm IPM program. Use pheromone traps to determine the main flight period for moths. Moths mostly fly under cover of night and go unspotted. At first sign of moths, release trichogramma wasps to destroy eggs. Inspect silk for larvae, eggs regularly. Employ beneficial insects, such as green lacewings, minute pirate bugs and damsel bugs. All will feed on corn earworm eggs and small larvae. Spray or inject silks weekly with Beneficial Nematodes to control larvae. 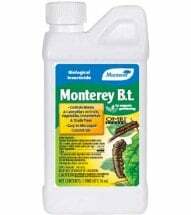 If corn earworms persist, apply Safer Garden Dust (Bacillus thuringiensis) or Monterey Garden Insect Spray (Spinosad) to silks at 5-10% formation and continue weekly until tassels turn brown. 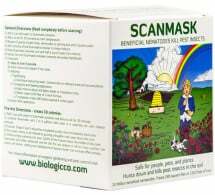 Both products are listed in the Organic Materials Review Institute’s products certified for use in the USDA’s National Organic Program. 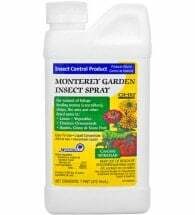 Tip: When using mineral or vegetable oils to suffocate feeding larvae at the ear’s tips, include a botanical insecticide in the oil as an added punch.